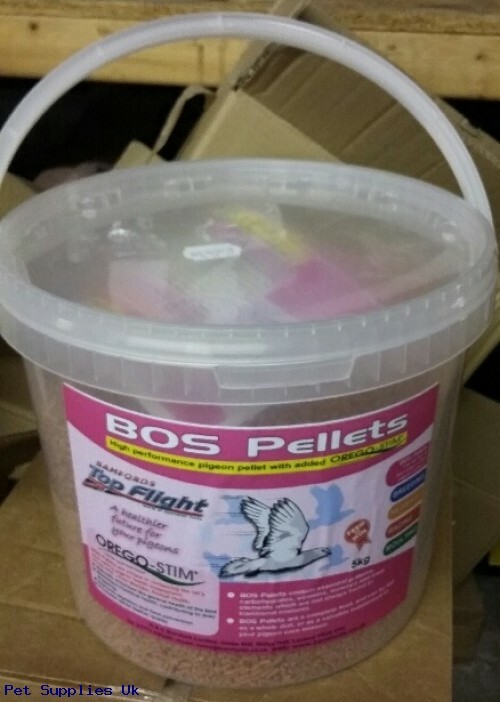 Bamfords Bos Pellets is a high performance Racing pigeon pellet with added OREGO-STIM. A Healthier future for your pigeons. Boss pellets are unique in containing the Uk`s best selling pigeon health supplement, Orego stim, from Meriden Animal health. Bos Pellets contain essential proteins, carbohydrates, vitamins, minerals and trace elements which are not always found in traditional mixtures. Bos Pellets are a complete feed, and can be fed as awhole diet, or as a baluable supplement to your pigeon corn mixtures. Bos pellets can be fed at any stage of the pigeon season - Breeding - Rearing - racing - Moulting.